A Zion Narrows Bottom-Up hike is an amazing experience, even self-guided, and for most, that is the way to go. 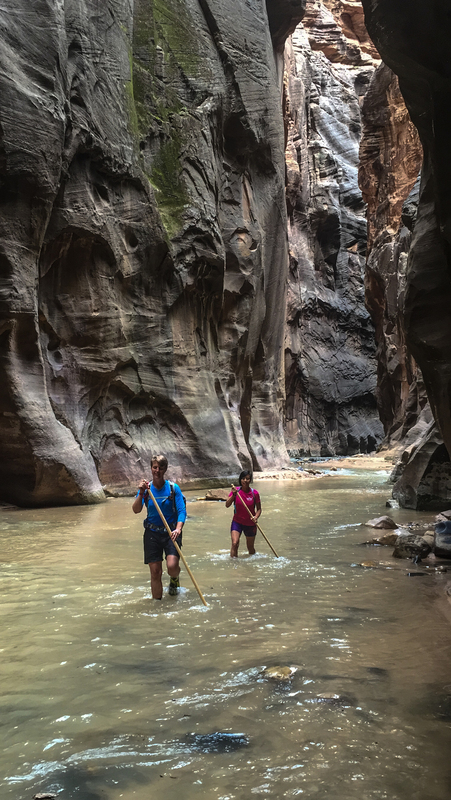 Despite certain restrictions set forth on tour companies by Zion National Park, a Guru Day in the Narrows has always proven to be exceptional. We delve deep in the geologic story of Zion, human and natural history, and highlight many significant moments in the 18 million year timeline of the Narrows. Along the way there are many moments of learning, but also a great deal of fun, reflection and meditation, and photography galore. (June-mid-October) Includes your private guide(s), outfitting with our Canyoneer 3 footwear, neoprene socks, walking pole, dry day pack, and hiking pole. Usually 6-7 hours including 2 hours of shuttle round-trip transportation. (mid-October-May) Includes your private guide(s), outfitting with our Canyoneer 3 footwear, neoprene socks, walking pole, dry day pack, hiking pole, dry pant/drysuit, and round-trip transfer from Zion Guru to the trailhead. Colder weather extends preparation, outfitting and travel time. Usually 7 - 8 hours, including round trip transportation (may be on shuttle or our executive van). NOTE: You must bring your paid entrance fee receipt or show your National Park's Pass for all tours which enter Zion National Park. Guest who have not yet paid their entrance fee will be required to pay $20/person as we enter the park.